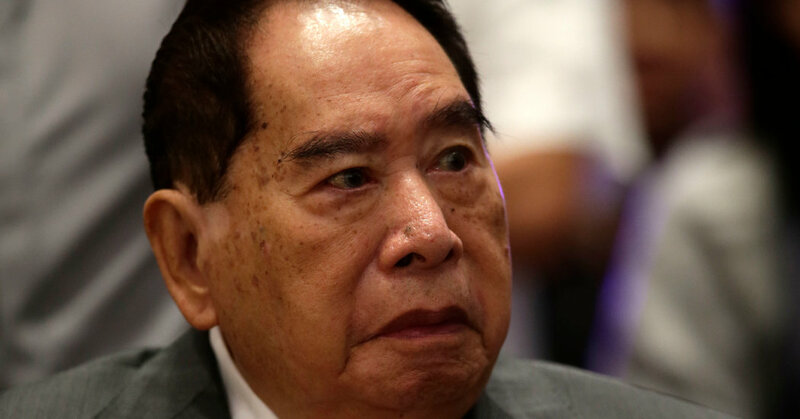 MANILA — Henry Sy, a tycoon known as the “father of modern Philippine retail,” whose chain of super malls changed the country’s retail landscape, died on Saturday in Manila. He was 94. His company, SM Investments Corporation, announced the death. For the last 11 years, Forbes had named Mr. Sy as the Philippines’ richest person, with a net worth of $19 billion. He opened the first ShoeMart in 1958 after a stint selling surplus boots. It later became known simply as SM. From a tiny shop in downtown Manila, SM grew into a behemoth with 62 department stores, 56 supermarkets and more than 200 smaller grocery stores, with revenues of $6.7 billion in 2016. The SM chain also operates six malls in China. Born in Fujian, China, on Oct. 25, 1924, Henry Tan Chi Sieng Sy moved with his family to the Philippines in search of a better life when he was 12. His father operated a small store selling a variety of wares, but World War II left the family with nothing as Manila was destroyed. At his father’s shop, Mr. Sy helped sell rice, sardines and other household merchandise. When his family decided to return to China, Mr. Sy stayed behind to pursue a business degree at Manila’s Far Eastern University, where he graduated in 1950. After years of struggling, he opened his tiny shop in 1958, which would become the first in an empire that would diversify into banks, property development and other allied businesses. In 1972, he opened the first SM department store in the downtown Quiapo district; that was the same year the dictator Ferdinand Marcos declared martial law, plunging the country into two decades of brutal rule. At the time of his death, Mr. Sy was chairman emeritus of SM Investments. In 2006, he opened the SM Mall of Asia, his flagship mall that houses more than 800 shops and an Olympic-size ice-skating rink. Thousands of people visit the mall every day, and it has become a major tourist attraction. SM Investments’s empire includes SM Retail Inc., which operates the country’s largest supermarkets and department-store chains, and SM Prime Holdings Inc., a huge mall operator. It also includes Banco de Oro, now known as BDO Unibank. He is survived by his wife, Felicidad Tan-Sy; six children, Teresita Sy-Coson, Elizabeth Sy, Henry Jr., Hans, Herbert and Harley; and several grandchildren. His eldest daughter, Ms. Sy-Coson, and Henry Sy Jr. are co-vice chairs of SM Investments. His son Harley is executive director. He had also tapped his longtime protégé, Jose Sio, as the new chairman of the group. Mr. Sy was also a philanthropist, and his charitable foundation contributed to universities and education. Harley Sy once described his father as more than a dreamer, but also a “doer” who valued maintaining a “simple life” and helping the less fortunate.